The Theia spring 2018 bridal collection was inspired by what creative director Don O’Neil refers to as “pearls of wisdom.” Pearls hold many unique attributes such as their strength and integrity, two characteristics prominently showcased throughout the stunning new line. 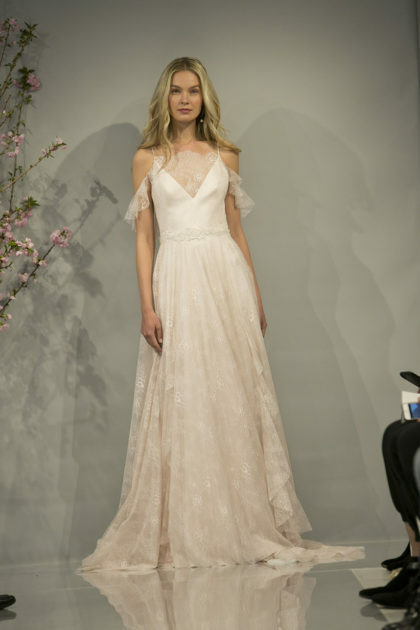 Each gown embodies O’Neil’s fascination with pearls, whether through the opalescence of the line’s color scheme of ivory, white, blush, pale blue and gray or the abundance of pearl embroidery featured. Theia Spring 2018 is a collection of sophisticated silhouettes that counter the traditional bridal gown, and if you’re anything like us, you won’t be able to get enough! Mark your calendars! Bridal Boutique in Lewisville is hosting a Theia trunk show next weekend, July 15-16. Contact Bridal Boutique at 972.219.8500 to schedule your appointment for the sale. You can also find Theia locally at Lovely Bride Dallas. Keep an eye on our events page for all upcoming sales and trunk shows from our local bridal boutiques. Cheers!